Numerical Modelling of Wave Energy Converters: State-of-the Art Techniques for Single WEC and Converter Arrays presents all the information and techniques required for the numerical modelling of a wave energy converter together with a comparative review of the different available techniques. The authors provide clear details on the subject and guidance on its use for WEC design, covering topics such as boundary element methods, frequency domain models, spectral domain models, time domain models, non linear potential flow models, CFD models, semi analytical models, phase resolving wave propagation models, phase averaging wave propagation models, parametric design and control optimization, mean annual energy yield, hydrodynamic loads assessment, and environmental impact assessment. Each chapter starts by defining the fundamental principles underlying the numerical modelling technique and finishes with a discussion of the technique’s limitations and a summary of the main points in the chapter. The contents of the chapters are not limited to a description of the mathematics, but also include details and discussion of the current available tools, examples available in the literature, and verification, validation, and computational requirements. In this way, the key points of each modelling technique can be identified without having to get deeply involved in the mathematical representation that is at the core of each chapter. The book is separated into four parts. 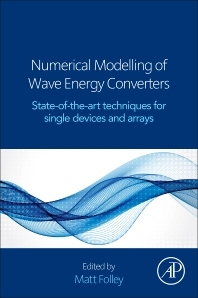 The first two parts deal with modelling single wave energy converters; the third part considers the modelling of arrays; and the final part looks at the application of the different modelling techniques to the four most common uses of numerical models. It is ideal for graduate engineers and scientists interested in numerical modelling of wave energy converters, and decision-makers who must review different modelling techniques and assess their suitability and output. graduate students and researchers in the area of wave energy conversion, engineering professionals involved in the development of wave energy converters. Matt Folley is currently a Senior Research Fellow in the Marine Renewables Research Group at Queen’s University Belfast and member of the SuperGen UK Centre for Marine Energy Research, dedicated to the establishment of marine technology as a means of sustainable power generation. He has been modelling wave energy converters for over 25 years and has first-hand experience of developing and using a wide range of numerical models of wave energy converters and wave energy converter arrays. He was a co-founder and inaugural convenor of the wave energy converter array network (WECAN), which is an international expert group focused on the modelling of wave energy converter arrays. He is also chair of the IEC international committee for the development of standards for the assessment and characterisation of the wave energy resource and UK principle expert on the IEC international committee for the development of standards for the assessment of the performance of wave energy converters. He has worked with a number of companies on modelling their wave energy converters, including WaveGen and Aquamarine Power.